The design and configuration of a men's ring needs to address two major issues. Men are surely more interested in style and appearance than they were a decade ago. The designs for men's rings need to make a statement without, becoming too flamboyant or loud. When putting together the specifications for a men's gold or 925 silver ring, it is important to ensure that the incorporated features make the jewel durable. Most men lead a hectic lifestyle, they expect the accessories that they wear to keep pace with their daily routine. 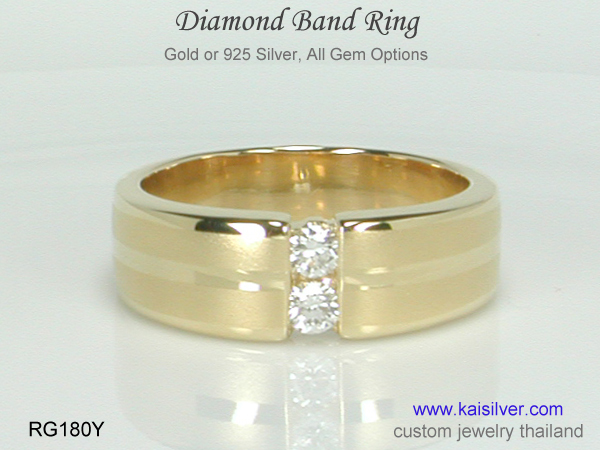 Kaisilver custom makes men's rings in gold and 925 silver with no limitation on design or gemstone. Our designs are finalized after studying the habits and lifestyles of modern men. Review the men's rings in this section to get an idea of the quality standards that we maintain. A broad and handsome ruby ring for men, custom made in gold and 925 sterling silver. 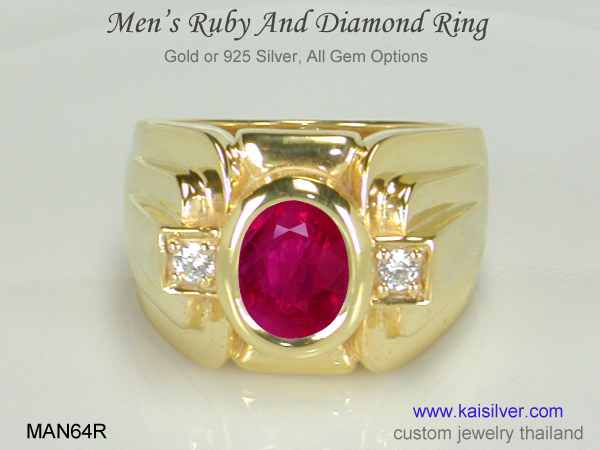 Kaisilver provides natural certified ruby gemstones and each ring, is crafted by highly skilled artisans. The ring is configured to be durable and long lasting ... more. A diamond wedding or engagement ring, the design concept is awesome for both men and women. The ring is shown with a 4mm round diamond but you can choose the size of the gemstone or diamond for your ring, read all about this ring ... more. Men's rings with diamonds are exclusive jewels and be quite expensive. It is important to have complete information about a diamond ring before making a purchase. 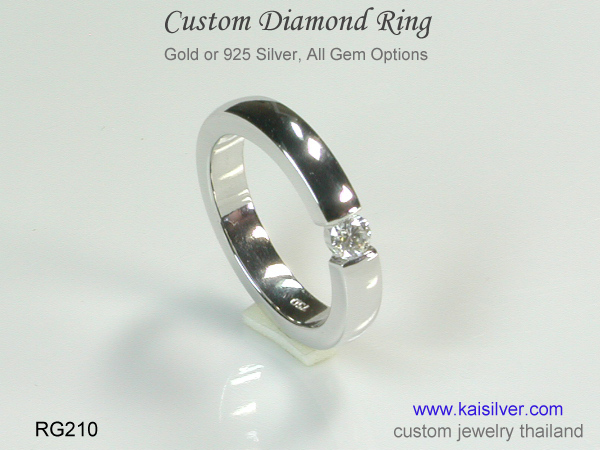 This men's diamond ring provides quality and value, learn all about this jewel ... more. 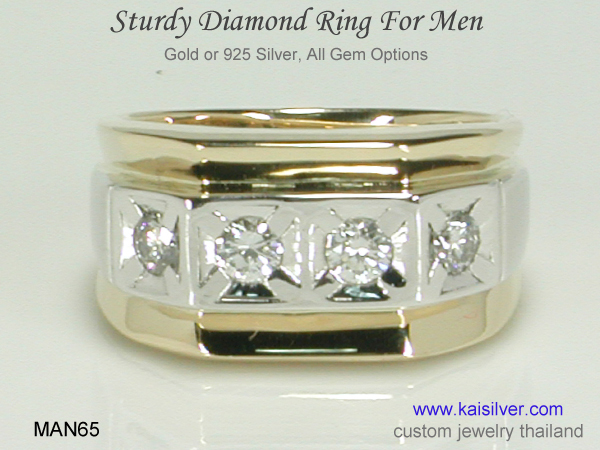 A reliable and sturdy men's diamond ring, custom made in gold or 925 sterling silver. All design modifications can be accommodated. You can request for 3 diamonds and this will increase the band width of the ring. Read all about it ... more. This men's rings brings together all the features that you would expect from a high end jewel. 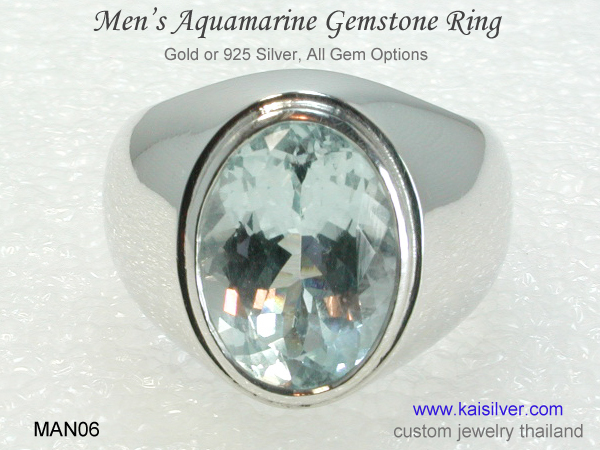 You can order the MAN06 gold or silver men's ring with the gemstone of your choice. Superior workmanship and natural certified gems for all rings ... more. 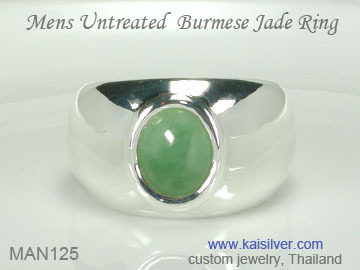 Jade the gem with a mystic appeal and tremendous history and traditions, Kaisilver features the gemstone in this impressive custom jade ring for men. Handpicked form the Burmese mines in Kachin, the gem is natural and untreated ... more.